This entry was posted on February 4, 2018 at 7:48 am and is filed under Bicycle racing, Cyclo-cross. You can follow any responses to this entry through the RSS 2.0 feed. You can leave a response, or trackback from your own site. We subscribe to HBO via Apple TV, and Hulu, though I think that’s gonna have to go (“Baskets” is not interesting enough to keep that subscription running). But pay for sports? Pfffbbbbllhllffff. Never been a big fan, which sounds odd, coming as it does from a former assistant sports editor. 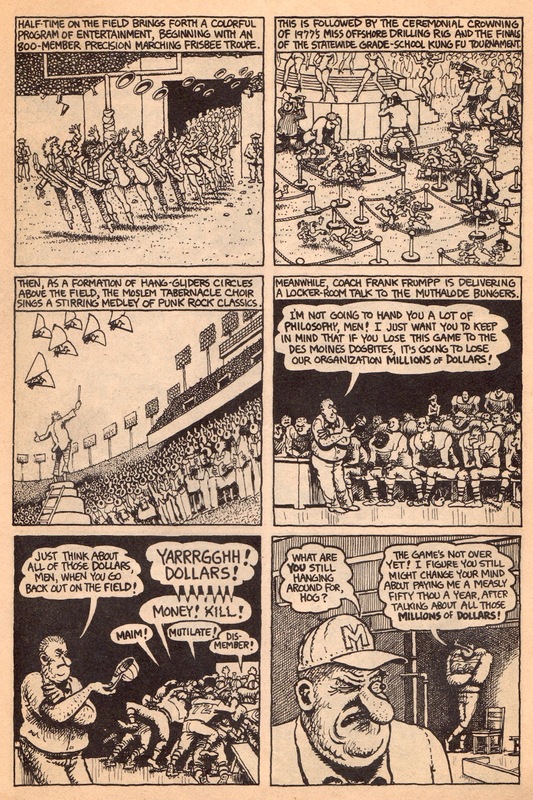 Gilbert Shelton, creator of “The Fabulous Furry Freak Brothers” and “Wonder Wart-Hog,” did a great sendup of halftime entertainment in a tale of the Hog of Steel becoming a pro footballer. 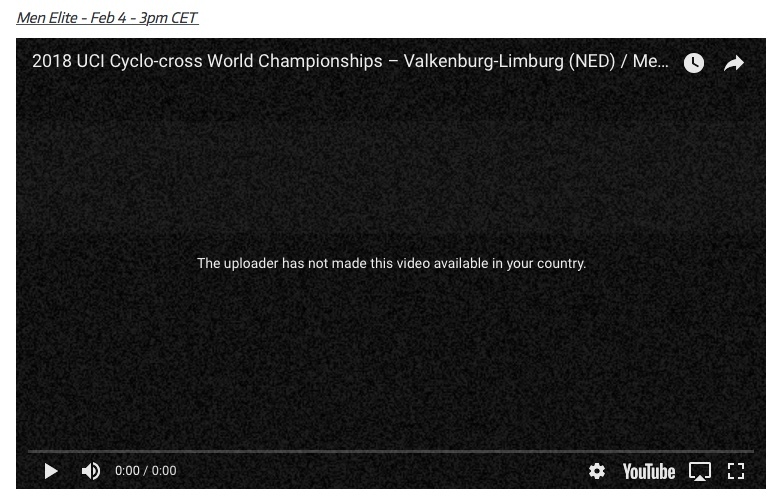 ‘Cross World’s is free on RAI Sport 1 over here… but it’s not live. They won’t show the elite men until almost midnight tonight. To watch stuff not available or only with silly delay we signed up for Eurosport Player for less than $75 for the year. In the US you can do the same by using a VPN to trick them into thinking you’re not in the land-of-freedumb. We don’t need the VPN over here + the apartment’s “Smart TV” lets us get Youtube so we can watch PBS Newshour,, Real Time with Bill Maher, etc. The only thing missing is SKY’s Bike Channel, but I’m not keen on handing Rupert Murdoch and Co any money if I can help it. 39.99 for the year …July through June. Get it now anyway…replays, still a few cross races, road etc. Fubo has Giro this app does not. NBC does do TdF Vuelta. Worlds all disciplines elite men and women only. Charles and I used that app during Live Update Guy, but I croaked it after NBC hired Megyn Kelly. Couldn’t feature giving the Peacock my pennies after that. NBC Sports Gold. I think I paid $50 for a year (subscriptions generally run from 7/1 to 6/30) which gives me TdF, Vuelta, Roubaix, Liege, Tour of California, various other ASO-owned events, as well as the CX World Cup and World Championships. I would gladly dump Comcast if my family would allow. Sadly, I appear to be the minority party in our little congress. Don’t get me started, but GET OFF MY LAWN. Old fart took over for a moment. yep. nbc gold is the ticket. there was another pay channel ( i can’t remember the name) that showed the dvv races and it was free at first then they started charging $30 a month. the women’s race was pretty good. it was nice to see cant and compton battling it out. the men’s race was kinda boring but surprising none the less. the superbowel was more interesting. i was appalled by the dodge ram commercial fearturing dr martin luther king.